Cleansing can be a challenging process – but now it can taste good! Fiber Cleanse Green Apple offers sensitive palates a much milder,pleasant tasts, with all the same powerful cleansing action of the original Fiber Cleanse. Fiber Cleanse – Green Apple Flavored contains a balanced blend of 28 herbs in a psyllium and flax seed base to help you cleanse the colon, restore optimal bowel function, and ensure timely elimination of toxins from the body. 2 Tablespoons – Over 200 lbs. Mix serving in 6 to 8 ounces of your favorite juice or purified water. Immediately drink upon mixing. Optimal benefit may be acheived by using first serving early in the morning and second serving, if desired, before noon followed with ample water throughout the day (1/2 ounce of water for each pound of body weight). If bowels become too loose reduce serving size and/or frequency. Keep lid tightly closed after opening and store in a dark, cook, dry place. Do not refridgerate. Contradictions: Persons who are pregnant, lactating, on prescription medication or on other herbal products should check with a nutritionally minded, health care professional before using. Individuals exposed to excessive amounts of psyllium dust (primarily occupational exposure) may develop a sensitivity resulting in an allergic reaction. 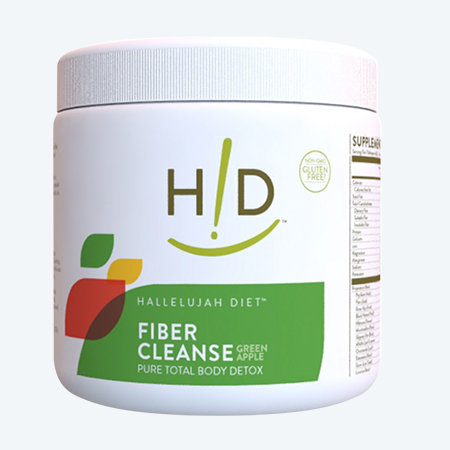 Use Fiber Cleanse during the first 2-3 months on The Hallelujah Diet. Not recommended for long-term use. After 3 months, you may switch to ground flax seed or B-Flax-D, which can both be used long-term. More Than Clean…Detoxified! We all practice proper hygiene. We shower or bathe everyday, wash our hair, launder our clothes…after all, cleanliness is next to godliness, as the saying goes. That all makes for a pretty picture on the outside, but what’s going on inside? Deep down, within the winding, twisting intestine known as the colon, a dark, dirty and dismal picture emerges—a world of toxic waste buildup, gnawing parasites, intestinal pollution. Yes, the grime of mucus, undigested fatty foods, chemicals from processed foods and simply breathing dirty air and drinking impure water takes its toll. Over time, this buildup affects the function of every cell and organ in the body. Without proper elimination the waste and toxins poison the blood, lymphatic system, nervous system and brain. They clog the heart, vascular system, lungs and sinuses.